When best friends Kip and Johnny decide to explore an abandoned military base close to their homes, they unwittingly start a horrifying chain of events. They come across a series of underground tunnels containing strange-looking machinery and a laboratory. They also come across a long-dead corpse laying underneath a sheet... and the sheet begins to move! The petrified boys flee in fear of their lives but the 'thing' under the sheet doesn't want them to escape alive. 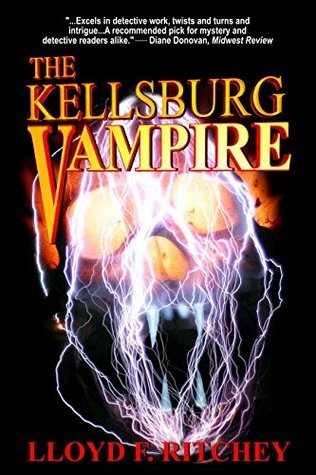 When disfigured bodies begin to pile up in town, Sheriff Colvin tries to work out what's happening, but when the dead reappear as hideous monstrosities; he realises everyone in Kellsburg and the surrounding areas are in deadly danger from a terrifying entity. 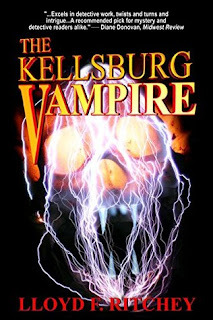 The Kellsburg Vampire is a super book. The reader is thrown straight into the action as the two boys begin their exploration of the underground tunnels and I have to admit I was literally terrified too! The plot is very original and not just another vampire rehash - without giving anything away, this one takes a different direction altogether. After such a good start it was always going to be difficult maintaining the 'terror factor', and even though it did dip in parts, it was still a very enjoyable read. My thanks to author Lloyd F. Ritchey for providing a copy of this book. The locals called it a vampire. Or a zombie. Or just “monster.” Sheriff Greg Colvin didn't care what they called it, as long as he could kill it. It started when two young boys explored the abandoned North Ridge Military Base just north of Kellsburg. They stumbled upon underground tunnels, and a hidden laboratory. And opened doors they should not have touched. Now the isolated town is suddenly plagued by a chain of ghastly murders, victims’ bodies defiled in a way the medical examiner says is impossible. People disappear, and then return—as living abominations. As Kellsburg descends into chaos, Colvin and a handful of volunteers enter North Ridge in a desperate attempt to stop the killings. In shadowed chambers ringing with the screams of torture and inhuman experiments, Colvin and his team confront a horror beyond their darkest nightmares. Colvin's struggle to save himself, his town, and perhaps humankind itself, has just begun.